Anarchist Gregori Maximov's analysis of Lenin's repression of opposition factions within the Bolshevik Party during 1920-1921. Grigori Petrovitch Maximov (1893-1950), Russian anarcho-syndicalist. After studying for the priesthood, Maximov went to Saint Petersburg, where he graduated as an agronomist at the Agricultural Academy in 1915. He joined the revolutionary movement as a student, was an active propagandist and, after the 1917 revolution, joined the Red Army. When the Bolsheviks used the Army for police work & disarming workers, he refused to obey orders and was sentenced to death. Only the intervention & solidarity of the steelworkers' union saved his life. In 1918 Maximov edited the anarchist-syndicalist papers Golos Truda (Voice of Labor) and Novy Golos Truda (New Voice of Labor). He became a leading figure in NABAT (Anarchist Organizations of Ukraine, organized by Volin) and secretary of the Confederation of Russian Anarcho-Trade Unions. He was imprisoned by the Bolsheviks, along with other members of NABAT, on March 8, 1921, during the Kronstadt revolt, in the Taganka Prison, Moscow. Four months later he began a hunger strike for 10 & a half days & ended it only after the intervention of European Syndicalists attending the Congress of the Red Trade Union International secured their exile abroad. Expelled, along with Volin & others, Maximov went to Berlin, where he edited Rabotchy Put’ (Labor's Path, or, Worker's Way), a paper of the Russian Syndicalists in exile & participated in founding the A.I.T. (umbrella organization of anarcho-syndicalists of 12 countries - FORA, USI, SAC, FAUD, CNT, etc. – which encompassed several million members and was headed by Rudolf Rocker, Augustin Souchy and Aleksandr Schapiro), as well as the "Committee of Defense of the Revolutionists Imprisoned in Russia". Maximov then moved to Paris, then the USA, where he settled in Chicago and worked as a tapestry maker & became a leading newspaper trade unionist of the IWW (Industrial Workers of the world). He edited Golos Truzhenika (Worker's Voice) & later Delo Truda – Probuzhdenie (Labor's Cause-Awakening) until his death on March 16, 1950. Taking as point of departure the Marxian theory of centralization, of the "dictatorship of the proletariat," of the state and its role in the period of transition from Capitalism to Communism, during which the state is supposed to be not a free institution but the organ of repression and annihilation of the enemies and adversaries of the Proletariat, Lenin inescapably and logically arrived at the conclusion that the "dictatorship of the proletariat" in reality is something like the "slaveholding democracy" of ancient Greece. This was, as we have already showed, the argument he used against K. Kautsky. But he overlooked the very elementary fact that (as every high school boy knows) the slaveholding democracy of ancient Greece was torn by internecine struggle within the slaveholding class itself-a struggle for power and privileges, for the right to rule over the demos. As a result of this bitter conflict democracies often degenerated into oligarchies and tyrannies. The state, Lenin said, is the proletariat; it is the vanguard of the proletariat; it is we, that is the Communist Party. Consequently, under the "dictatorship of the proletariat" "our" party must be the slaveholding class; it must, therefore, inevitably repeat to some extent, the history of the slave holding class of democratic Greece and undergo the same internecine strife as that between the partisans of the slave-holding democracy and oligarchy. In 1920 the Communist Party entered into this degenerative phase of development. Lenin was a demagogue: having brought "his class," his party, to power under the banner of democracy, he immediately established an oligarchy, and his own pre-eminence as the first among the oligarchs has never been challenged. As long as common danger existed, the party "demos" suffered this tyranny; but no sooner was the danger alleviated, no sooner did the civil war come to an end, then the lower strata broke into rebellion against the oligarchy; this opposition was met with ostracism, which resulted only in intensifying the struggle. We saw that, according to Lenin, the Marxian "dictatorship of the proletariat" connotes the dictatorship of the vanguard of the working class, and since such a vanguard can be only the party, the "dictatorship of the proletariat" is in the last analysis, the dictatorship of the party, and by the same logic, the adversaries and enemies of this dictatorship inevitably are, as we have shown, all those who do not belong to this ruling party. And since the state of the transitional period is also the party, and since this state must ruthlessly suppress its adversaries, it follows logically that terror has to be applied against all, save a very small handful of the "vanguard of the proletariat" organised into a party. The party is organised upon the principles of centralisation and subordination to the leaders. In order to maintain their own positions, the leaders organise around themselves a clique with whose aid they get control of the party apparatus, manning it entirely with their own people. Hence we have the dictatorship of the leaders within the party, arid the "dictatorship of the proletariat" becomes the dictatorship of the leaders. The state ‘becomes first the state of the leaders, and then the state of one single leader Such was the role of Lenin, and, in our own time, Stalin, When Lenin said the state it is we, by "we" he meant himself; hence to oppose Lenin was to oppose the state, the dictatorship of the proletariat which necessarily had become the state of one leader. 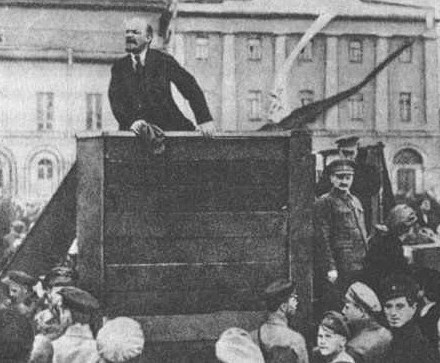 Having become the state, Lenin proceeded ruthlessly to suppress his adversaries. But just as the dictatorship of the party inevitably brings forth resistance within the country, (a resistance ruthlessly suppressed by terror), so does intra-party dictatorship inevitably beget among certain of its members discontent, then protest, and finally overt rebellion. These discontented and rebellious members of the party, according to the essence of the "workers’ state," are the objects of the suppression and terror. So intra-party terror, just as terror within the country, has the same source: centralisation, dictatorship and the state. The revolt within the party began when Lenin was still alive; he kept on suppressing it through terror, ever tightening the inner regime to prevent open rebellion or to quell it in its incipient phases. The dictatorship of Lenin and his clique early accumulated much discontent hut the members themselves restrained their differences during the years of civil war. But a conflict was developing in the party along two lines: the ideological issue and the actual struggle for power within the party and the country. Despite Lenin’s efforts, the rank and file had not lived down the ideals of 1917, the ideals of the Paris Commune-Whereas they put up with the dictatorship both in the Party and the country during the civil war, upon its termination they demanded that the oligarchy give place to a genuine workers’ democracy-Opposed to the rank and file was the Party bureaucracy which defended its own position of power. To disagree with the bureaucracy was to place oneself outside of the "vanguard of the working class," to deviate in the direction of "petty bourgeois Anarchism, which threatens the unity of the Party and the maintenance of the dictatorship of the proletariat..."
The Workers’ Opposition, which emerged during the 1920 discussion concerning trade unions, could not subscribe to this interpretation. Thus, there arose along with the trade union question, a complex of other problems, such as: bureaucracy and democracy in the party as well as the state, freedom, the role of the party, syndicalism, labour discipline, etc. There were many other issues and many sides to each issue, but notwithstanding all their differences, the representatives of these several platforms were unanimous in their condemnation of the Workers’ Opposition headed by Shliapnikov, Medvediev, Kolontay and others. Following Lenin’s historic analogy, we may say that intra-party strife immediately assumed the character of a struggle between the Communist patricians and the Communist plebeians, with the difference, however, that the Communist Grachii perished without having obtained any improvements for the plebeians of the party. Lenin, as head of the Communist patricians, and experienced in matters of party strife, immediately realised the seriousness of these discussions. "The bitter truth should be faced courageously," he wrote in the article "The Party Crisis". "The party is shaken with fever. The question becomes: is the malady limited to the upper layers and exclusively those of the Moscow party or has the entire organism been stricken? If the latter be true, can this organism be fully cured within a few weeks (prior to and following the party convention)? Can it be immunised against recurrence of the malady, or will its illness assume a long drawn-out and dangerous character?" The malady, as we know now, proved a chronic affair. The party organism was stricken with a cancer which demanded surgical treatment. Since that time, it has undergone constant painful and serious operations which made it unrecognisable; but the cancer has not yet been cut out and a dreadful death is imminent in the near future. Lenin addressed himself to this problem. "What is to be done," he asked, "for the quickest and surest solution?" And he answered, "We need a close examination of all participants, an examination guided by a certain partiality". And he evolved those methods or maintaining obedience which he applied outside of the party, in the country as a whole: threats, intimidation, in a word-terror. "The Party Crisis" was intended as a warning to the participants in the party discussion who were getting out of control, and especially to the Workers’ Opposition and kindred groupings who were demanding freedom and democracy. "We must combat ideological disharmony and those unhealthy elements of the opposition who renounce any ‘militarization of economy;’ thus rejecting not only the ‘methods of appointment’ which have been in practise until now, but any possible ‘system of appointments’ (rather than elections); in the last analysis this means the denial of the leading role of the Party in regard to the mass of non-party people. We must fight against this syndicalist deviation, which will ruin the party, if adopted". To Lenin, the "unhealthy elements of the opposition" were the party plebs who demanded the abolition of the oligarchic party regime and of the dictatorship of the patricians. Having reviled them as "loud mouths," having stigmatised their demands as "the worst forms of Menshevism," he frightened all other dissenters into submission by declaring that "the capitalists of the Entente will undoubtedly take advantage of our party’s weakness by invading us again, and the Social Revolutionists will organise plots and rebellions". These warnings and threats were made in the midst of the discussion on the role of the trade unions, in January, 1921, but since the tenth convention of the party was scheduled for March, actual repressions were postponed. Lenin was confident that since the party apparatus was in his hands, all his recommendations would be adopted and terroristic measures against any and all opposition groups would be legalised. The tenth party convention began on March 8 and ended on March 16, 1921. In his "Inaugural Speech," Lenin of course, did not fail, to cut short the discussion by impressing the delegates with the danger inherent in party wrangling and disagreements; and naturally he called for unity, which meant for him the stabilisation of the party status quo. "You, Comrades, must know," lie declared, "that all our enemies and their name is legion-in innumerable foreign publications repeat and amplify the countless rumours which our bourgeois and petty-bourgeois enemies circulate here within the soviet republic, namely: if there is discussion, that means there arc wranglings; if wranglings, there must be dissension’s; and dissension’s mean that the Communists have weakened and the time has come to take advantage of their weakness. This has become the slogan of a world which is hostile to us. We dare not forget it for a single moment We must show that, whatever luxury of discussion we permitted ourselves, rightly or wrongly, in the past, we now recognize the need for greater harmony and unity than ever before. We must tell ourselves, after having duly considered the profusion of platforms, shadings, delicate gradations of opinion at our Party convention, that much as we may disagree and wrangle here, we have so many enemies and the task facing the dictatorship of the proletariat in a peasant country is so great, that formal solidarity is not enough. Henceforth we cannot afford the slightest trace of factionalism, regardless where and how it might have occurred in the past". On that very same day Lenin, in his "Report on the Political Activity of the Central Committee of the Communist Party," regretted that he had allowed so much discussion in the party, "On my own account I must add that this luxury should not have been permitted, and that in allowing it we were no doubt in error". Lenin complained that when he pointed out to the comrades the difficult situation of the country-poor crops, army demobilisation, economic crisis and ruin-saying that under these conditions it was necessary to maintain the closest unity and that "the atmosphere of controversy is becoming highly dangerous, some comrades, to whom I happened to talk a few months ago, and to say, ‘Beware, here is a definite threat to the rule of the working class and its dictatorship’ replied, ‘this is a method of intimidation, you terrorise.’ I had to listen several times to this libelling of my remarks but I always answered that it would he ludicrous for me to terrorise the old revolutionists who had undergone all kinds of trials in their lives". The speakers of the Workers’ Opposition and similar groups who took the floor on Lenin’s report, charged him and the Central Committee with administrative wilfulness and with gagging opinion; they demanded freedom of criticism and broad discussion. Osinsky accused Lenin and the Central Committee of having ousted Sapronov from the Presidium of the convention; while all the left groupings complained of lack of democracy in the Party, exposing all Lenin’s talk of unity as insincere since neither he nor the Central Committee had any confidence in the working class. Lenin’s answers were demagogic and rude: Do you want to carry on discussion? You can do it in the pages of Pravda, they are open to you. Sapronov was ousted? Hut that is a trivial matter which should be ignored. Lack of confidence in the working class? "This is wholly untrue. We are looking for and are ready to take from the ranks of workers any one with the least administrative ability. We examine him". Lenin assailed chiefly the Workers’ Opposition. His target was a clause in Kolontay’s pamphlet, which stated that organising the management of the national economy belongs to the All-Russian Convention of Producers, united into trade and industrial unions, which is to elect a central organ administering the national economy. Lenin’s refutation was: "After two years of Soviet power we openly declared a? the Communist International to the entire world that the dictatorship of the proletariat is possible only through the Communist Party. - … Despite all this, there are people ‘class conscious people, who tell us that ‘organising management of national economy belongs to the All-Russian Convention of Producers.’ An All-Russian Convention of Producers-what would that be? Should we waste our time on such oppositions within the party? It seems to me that we have had enough of this. All this talk of freedom of speech and freedom of criticism constitutes nine tenths of the meaning of the speeches of the ‘Workers Opposition,’ which in reality have no meaning at all". And further: "The All-Russian Convention of Producers should manage production? I am really at loss when I try to characterise this jumble of words. But I am comforted by the thought that we have here party and soviet workers who have been engaging in revolutionary activities for the last one, two or three years, and it would be a mere waste of time to criticise such phrases before these comrades, for they themselves close discussion when they hear such speeches; these are boring and it shows a lack of seriousness when people talk about an All-Russian Convention of Producers which is to manage the national economy". "Way back last summer at the second congress of the Communist International I referred to the resolution on the role of the Communist party. This resolution unites the Communist workers in the Communist parties of the whole world. And this resolution explains everything". Lenin’s patrician sentiment was outraged by the Workers’ Opposition. He refused to even consider the idea that a convention of producers and not the party-that is, he himself-should administer production. And at the same time he ridiculed personally the representatives of the Workers’ Opposition: "Thus, Comrade Kolontay and Shliapnikov, and the ‘class-conscious’ people who follow them, want to subject to their guidance the Councils of National Economy, the central organs and principal committees as well as the Rykovs, Nogins and other ‘nonentities’ and to lay down theoretical tasks for them. Can we be expected, comrades, to take all this seriously?". One of the planks of the platform of the Workers’ Opposition reads, "it is the decision of the Workers’ Opposition to remain in the party when defeated at the convention and to uphold firmly the point of view of the opposition, saving the party and rectifying its line." Lenin comments ironically: "‘Even when defeated at the convention’! what foresight, indeed. But begging your pardon, I, for one, can confidently declare that the party convention shall not permit this". Hence, before the convention had passed its decision, Lenin had already resolutely proclaimed, "The Opposition is finished. The lid has been clamped down on its activities. And now, enough of the Opposition for us". What measures did Lenin suggest in the fight against the Workers’ Opposition? "We will sift the healthy from the unhealthy in the Workers’ Opposition...We will take those whom we want, and not those whom they want. - We shall win over to our side, the side of the Party, whatever is healthy and proletarian in the Workers’ Opposition, leaving behind the ‘class-conscious’ authors of syndicalist speeches." Sifting meant on the one hand disciplinary penalties and expulsions from the party, and on the other, outright bribing: "to draw the desirable elements nearer to the work and to promote them to higher positions". Lenin suggested, and the convention adopted, a long resolution censuring the Workers’ Opposition for its syndicalist and Anarchist deviation; it also declared that the propaganda of those ideas was incompatible with membership in the Communist Party. Moreover, he found the view of this group and of all similar groups and persons "politically incorrect and a direct danger to the maintenance of power by the proletariat". In a word, the Workers’ Opposition and similar groups were declared counter-revolutionary, and the apparatus, that is Lenin, was granted the right to react accordingly. This was precisely what Lenin sought and, as we shall see, did not fail to avail himself of this right. The discussion on trade unions marks the beginning of the disintegration of the Communist Party, the beginning of the struggle for power, which, with Kirov’s assassination assumed a highly dramatic and gruesome character. But at the time of the tenth party convention it was difficult to foresee that the discussion on trade unions would take such a turn. This convention prohibited all factional groupings within the party. The several groups which had emerged from this discussion -Trotzky’s group, Bukharin’s group, Ignatov’s group, Sapronov’s group of "democratic centralism," the Workers’ Opposition- all fell in line with the decision although the adherents of the Workers’ Opposition did not cease to propagate their ideas in the party. Thus Lenin’s group or "the group of ten": Lenin, Zinoviev, Stalin, Kamenev, Tomsky, Lozovsky, Rudzutank, Kalinin, Petrovsky and Sergeyev (Artem), scored a full victory. It was an easy victory for the apparatus. The bureaucrats, seeing themselves threatened by the rank and file who were demanding the realisation of the ideals of 1917, hastened to close their ranks and to build a united front against workers’ oppositions. Apart from the official Workers’ Opposition, there emerged another workers’ opposition group, "The Workers’ and Peasants’ Socialist Party"; the latter was not represented at the convention. It was headed by the sailor, Paniushkin, and was joined by those elements of the Workers’ Opposition who remained dissatisfied with the sub-mission of their leaders (Kolontay, Shliapnikov, Medvedev, Kutuzov) to the party bureaucracy. The new "party" declared that it "stood on guard of the October conquests"; it put forth the demand, "all power to the soviets and not to the party"; it sharply assailed the party intellectuals, and it demanded the abolition of privileges and a more just distribution of rations. It branded the leaders of the "Workers’ Opposition" as renegades who fell for soft jobs and comfortable positions in the party and state. The newspaper Pravda hastened to label Paniushkin as a "self-seeker" and "Jew-baiter" (his anti-Semitism is doubtful and has yet to be verified), accusing him of raising "the inglorious Kronstadt banner". Then Paniushkin and a few other workers were expelled from the party. On the other hand, however, this new opposition for a while was not only to be unmolested but even assisted in sundry ways: it was given quarters for a club; it was permitted to issue its publication ("Nabat") - Yet simultaneously, efforts were made to seduce the leaders with offers of position and power and to liquidate the membership in a painless manner. The active partisans were secretly put on the official list for surveillance. The attempt to disintegrate this movement from within the opposition itself proved futile. The opposition enjoyed great popularity among the workers: its meetings were crowded, its speakers were greeted with stormy applause, while the official Communists were met with catcalls. But on the night of June 7th, thirty-three prominent figures of this opposition were arrested, their publication was closed, and their program was confiscated in the printing shop. The prisoners were put in the Butirky jail, and some were afterwards sent to exile, notwithstanding the fact that many of them were old party members, dating their revolutionary activity back to 1903-1905. Thus, under the blows of intra-party terror, fell this workers’ opposition group. The repression’s against dissidents did not bring, however, all the desired results: the (discontent of the party rank and file was riot only unchecked but actually augmented. The workers’ opposition remaining in the Party continued to rebel against the bureaucracy, its privileges and luxuries. It was for the purpose of curbing the growth of the opposition that Lenin introduced party purges. At the party conference held in May, purges were accepted under the guise of a concession to the oppositionists who did not suspect that along with the "self-seekers", "hangers-on" and other harmful elements they themselves would also be victimized. While the first purge was directed against the bourgeoisefied upper strata of the party and little affected the opposition, subsequent purges became a powerful weapon of terror in the hands of the apparatus against all the discontented elements of the party. In line with this oppression was Lenin’s persecution of Miasnikov and the party organization of Motovilikha (of the government of Perm) which he headed. The Miasnikov episode is of much interest and we shall therefore dwell upon it at some length. A worker and one of the oldest members of the party, G. Miasnikov was the leader of the party organization of Motovilikha in the period of the trade union discussions. Capable, thoughtful, extremely devoted to the cause of proletarian emancipation, Miasnikov could not be reconciled to the abandonment of the party principles of 1917, the growing power of the oligarchy, the terror of the Central Committee and the bourgeois transformation of the upper layers of the party. He undertook to expose these developments toward the end of 1920 in Motovilikha. "It was because of this," Miasnikov writes, "as I found out later, that I was exiled ... to Petrograd, to mend my ways. There he had an opportunity of witnessing the drunken debaucheries of Zinoviev and the complete divorce of the party from the workers; the result of his observations was a memorandum sent by him to the Central Committee. Lenin replied in a letter with which Miasnikov in turn answered and disagreed. Lenin did not deem it necessary to continue this correspondence. His attempt at "persuasion" having failed, he, as we shall see, was soon to resort to "force". Miasnikov wrote to the Central Committee of the alienation of the working class and their enmity toward the party: "When I came to Petrograd, the city was in a festive mood; all the papers rejoiced that ‘the sleeper was awakening,’ that Petrograd industry was beginning to breathe freely, etc. But this was only Potemkin villages. Upon closer examination I began to see that, to my great amazement, all was not well in Petrograd. Mills and factories were frequently on strike, the Communist influence was lacking and the workers had no sense of participation in the government. It seemed far away and not their own. In order to get something from it, they had to exert pressure: without pressure, nothing could be gotten. The government threw the blame for the frequent strikes-the Italian strikes-upon the Mensheviks and the Social-Revolutionists, those pernicious agitators who were being arrested in order to save us from their seditious propaganda. But despite repressions, strikes did not stop". Miasnikov explains later: "In Moscow, Petrograd, in the Ural region, in all factories, the workers now show keen distrust of the Communists. Non-partisan workers gather in groups, with the Mensheviks and Social-Revolutionists leading the discussions; but no sooner does a Communist approach than the groups scatter or change the topic. What does this mean? In the Izhorsky plant the workers expelled all the Communists from their meeting, including those actually working in the plant. On the very eve of what was virtually a general strike in Petrograd (prior to the Kronstadt revolt), we did not even know that this strike was about to come off although we had Communists in every department. We only knew it was being prepared and led. What does this mean? It means that the working class has fenced itself off from the Communists by an impenetrable wall and the party is no more aware of this than were the sleuths of the Tsar’s time. The workers dubbed the "comcell" (Communist cell) "comsleuth". Why did they do so? Will you tell me that they penalise the Communist Party for no reason at all? That freedom of the press was granted and is still granted to the working class? My answer must be in the negative. The working class penalises the party because the methods which the party worked out in 1918-1920 to deal with the bourgeoisie are now (in 1921) being practised upon the working class. This cannot go on". Miasnikov continued: "We have freedom of speech in the markets, at the railway stations, in the trains, at the docks, but not in the factories arid the villages. There the Cheka vigilantly watches over the good behaviour of workers and peasants". He exposed the intra-party dictatorship and the servility and worship of rank which was developing: "Freedom of opinion in the party is being suppressed by the foulest means". "If one of the party rank and filers dares to have an opinion of his own, he is looked upon as a heretic and people scoff at him saying, ‘Wouldn’t Ilyitch (Lenin) have come to this idea if it were timely now? So you are the only clever man around, eh, you want to be wiser than all? Ha, ha, ha! You want to be cleverer than Ilyitch!’ This is the typical ‘argumentation’ of the honorable Communist fraternity. "Comrade Zinoviev told me in the presence of many comrades at the party conference of three districts: ‘You’d better stop talking or we shall have to expel you from the party. You are either a Social-Revolutionist or just a sick man’... Any one who ventures a critical opinion of his own will be labelled a Menshevik or Social-Revolutionist, with all the consequences that entails. This is the hack-ground of the disintegration and drunkenness in the upper strata of the party, under the motto of ‘one hand washes the other’; in the soviet institutions one has to announce his presence before being able to see any official, and everything is complicated by red tape. Political ‘pull’ is the essential factor in attaining public office. Astoria, guarded by machine guns, is the talk of the town: it is a resort for drunks". Miasnikov describes the situation in greater detail: "People keep quiet here. The silence spreads and they remain quiet until suddenly they understand each other and realise that there is nothing to talk about. Then, directly, they begin to fight violently among themselves. If one dares to express an opinion of his own, he is a self-seeker or worse-he is a counter-revolutionist, a Menshevik or a Social-Revolutionist. Such was the case with Kronstadt, too. Everything was nice and quiet there. And suddenly, without a word, the wallops started. - You ask, ‘What is Kronstadt? A few hundred Communists fight against us. What does that mean?’ But whose fault is it that the higher-ups in the party have no common language with either the non-partisan mass of people or with the rank and file Communists; that the misunderstanding is so great that it leads to violence? What is the significance of all this? This is the absolute limit. Miasnikov points out the emergence from this situation of a new type, the Communist sycophant: "A special type of Communist is evolving. He is forward, sensible, and, what counts most, he knows how to please his superiors, which the latter like only too much. Whether this Communist has influence among workers is of slight concern to him. All that counts is that his superiors be pleased". He describes the lack of confidence in the working class and the peasantry, and counters with his demand for workers’ democracy: "The party rank and file are permitted to speak of the peccadilloes, the very little sins; but one must keep silent about the larger ones. Responsibility before the Central Committee? But there is Comrade Zinoviev, one of the ‘boys’." "It stands to reason," Miasnikov continues, "that workers’ democracy presupposes not only the right to vote but also freedom of speech and press. If workers who govern the country, manage factories, do riot have freedom of speech, we get a highly abnormal state". Consequently Miasnikov demands the abolition of the death penalty and "for all -from Monarchist to Anarchist- a freedom of speech and press such as the world has never seen before". "We must base ourselves upon first, the working class and, second, the peasantry," Miasnikov counsels Lenin. "To believe that without active cooperation of both it is possible to restore the productive forces of the country and to create even a minimum of material welfare, is to try to realise the essential ideas of the Social-Revolutionists; it is to put our faith in bureaucrats, Communist heroes in this case, who will have everyone and everything from all ills and misfortunes. "People argue in this fashion: you workers and peasants must not stir, nor strike, nor rebel; and don’t get too subtle, for we have nice fellow-workers and peasants like you, whom we put into power; and those people will manipulate this power so that, unawares, you will find yourself in the Communist paradise". "Another contention of the bureaucracy is: If we grant freedom of speech to all, everything that has hitherto been hidden from the non-partisan masses of people and the enemies of the soviet power (such as strikes, rebellions, hunger, etc. ), will become known. "But we reply: it is not true that the masses are unaware of these disorders, but they learn of them not from our paper but from living people. Moreover, they know more than those in the leading circles of the provinces. The provincial Cheka continues to arrest people for spreading false rumours, but those people know more than the Cheka. The result of this ‘secret’ is that people do not believe our papers at all. "Those who fear to let the working class and peasantry speak out, always fear counter-revolution and see it everywhere". Lenin recognized the pertinence of the foregoing sentence; so he replied: "Freedom of press in the R.S.F.S.R. surrounded by bourgeois enemies everywhere means freedom for the bourgeoisie," "we do not want to commit suicide and that is why we will never do this" (i.e., what Miasnikov asks). "I hope," Lenin concludes, "that after sober reconsideration, you will not insist, because of false pride, upon a flagrant political error (freedom of press) but that having quieted your nerves and having overcome the panicky feeling, you will set yourself to work: to help maintain connections with the non-party people, to check up the work of the party people with the aid of the non-partisan names. "In this field there is no end of work. And it is thus the malady can and should be treated, and slowly cured; but this cannot be done by befogging your brain with ‘freedom of press’-a lustrous will-o’-the-wisp". "Words, words, as Hamlet said. You yourself realise that all that is not serious. It is strongly worded, hut far from convincing". "You say that I want freedom of press for the bourgeoisie; on the contrary, I want freedom of press for myself, a proletarian, who never had anything, a proletarian who has been in the party for fifteen years, who has been a party member in Russia and not abroad (Miasnikov hints broadly at Lenin, Trotzky, Zinoviev and other leaders in the party...) I spent seven and a half of the eleven years of my party membership before 1917 in prisons and at hard labour, with a total of seventy-five days in hunger strikes. I was mercilessly beaten and subjected to other tortures. I had to ‘hobo’ my way back and I escaped not abroad, but for party work here in Russia. To me one can grant at least a little freedom of press, at least within the party. Or is it that I must leave or be expelled from the party as soon as I disagree with you in the evaluation of social forces? Such simplified treatment evades but does not tackle our problems." Then Miasnikov vigorously attacks Lenin thus: "To break the jaws of international bourgeoisie, is all very well, but the trouble is that you lift your hand against the bourgeoisie arid you strike at the worker. Which class now supplies the greatest number of people arrested on charges of counter-revolution? Peasants and workers, to be sure. There is no Communist working class. There is just a working class pure and simple". "Don’t you know that thousands of proletarians are kept in prison because they talked the way I am talking now, and that bourgeois people are riot arrested on this score for the simple reason that they are never concerned with these questions? If I am still at large, that is so because of my standing as a Communist. I suffered for my Communist views; moreover, I am known by the workers; were it not for these faits, were I just an ordinary Communist mechanic front the same factory, where would I be now? In the Cheka, or more than this, I would be made to ‘escape’, just as I made Mikhail Romanov (Tsar’s brother) ‘escape’, as Luxemburg and Liebknecht were made to ‘escape’. Once more I say: you raise your hand against the bourgeoisie, but it is I who am spitting blood, and it is we, the workers, whose jaws are being cracked." "For anti-party activity and infractions of party discipline, C. Miasnikov is expelled from the party by the decision of the Central Committee of February 22, 1922". No one intervened on behalf of the expelled Miasnikov at the eleventh convention of the party. Lenin spoke only a few words on the matter, assailing the Workers’ Opposition for its appeal to the Comintern: "One must tell those who are using their legitimate right to appeal to the Comintern that in the Miasnikov case it was not altogether lawful for them to intercede. The Miasnikov incident took place in the summer of last year. I was not present in Moscow then and I wrote him a long letter, which he put into his pamphlet. I saw that the man had some abilities, that it was worthwhile to talk matters over with him, but that we had to tell him that any open criticisms on his part would be regarded as incompatible with party discipline. lie, however, wrote a letter advising us to rally in every district all the discontented elements. Yes, of course, to get such people together in every district is not at all difficult". "From 1922 up to the present time I have never been free from kind attentions, sometimes of the GPU, at other times of the Intelligence Departments of various foreign governments." Lenin began settling accounts with Miasnikov and Stalin finished the job. In the same period, between the tenth and eleventh party conventions, the Central Committee of the party, headed by Lenin, waged a vigorous campaign of terrorization against the Communist fraction of the trade unions. In this regard "The Report of the Central Committee of the Communist Party, from May 1 to June 1, 1921" furnishes quite interesting reading. We find here a description of the struggle of the Central Committee of the Party with the refractory Communist fraction of the All-Russian Trade Union Convention. The issue was the "independence" of trade unions from the party. Riazanov always pleaded for trade union independence along the German pattern. The Communist fraction of the trade union convention adopted Riazanov’s resolution. Tomsky, who was instructed by the Central Committee of the party to see to it that its own resolution was carried out, failed to do so. Hence the Central Committee of the party rejected Riazanov’s resolution and instructed Lenin, Bukharin and Stalin to deliver talks before the fraction "explaining why the resolutions adopted were unacceptable." It further resolved to remove Tomsky from the group of five appointed to guide the convention of the trade unions, and to put Bukharin in his place. The reorganized group of five was instructed to call a meeting of the Communist fraction of the convention for reconsideration of Riazanov’s resolution. "Whereas the resolution made by Comrade Riazanov, especially his speech at the meeting of the fraction, showed the utter disagreement of Riazanov’s views with those of the party upon the so-called ‘independence of the trade unions’, and whereas Comrade Riazanov violated for a second time the party discipline and the resolutions of the tenth convention, the Central Committee resolved to remove Comrade Riazanov from participation in the trade union movement. The organization which elected Comrade Riazanov as delegate was instructed to replace him by another delegate. "The Central Committee voted to administer an official rebuke to the Comrades Artem, Shliapnikov and Kutuzov who permitted an anti-party resolution to be carried at the party fraction of the convention without fighting for the party resolution; "To release Comrade Tomsky from duties in the All-Russian Central Trade Union Council and in keynoting the convention, his place to be taken by Comrades Tziperovich and Lozovsky; to grant Comrade Tomsky’s request for permission to absent himself from today’s session of the Communist fraction as well as from all other sessions of the trade union convention; to instruct Comrade Tomsky to transfer his obligations in the International Council of Trade Unions to Comrades Lozovsky and Tziperovich; to appoint a committee consisting of Comrades Stalin, Frunze, Kiseley, Dzerzhinsky to review the facts in this case and to determine whether in view of Comrade Tomsky’s infraction of party discipline, it is within the jurisdictional power of the Central Committee to penalize him or whether a party conference with powers exceeding those of the Central Committee need be called for that purpose; to hold the decision of the Committee as final if passed unanimously." And in this fashion Lenin’s Central Committee dealt with the most eminent party workers and members of the Central Committee like Tomsky. The Communist fraction of the convention, terrorized by the Central Committee, and subjected to the report of Lenin, Bukharin and Stalin, rejected by an overwhelming majority Riazanov’s resolution which only the previous day it had adopted by the same over-whelming majority. The investigation committee passed its decision on May 19, declaring Tomsky guilty "of a gross violation of party discipline and a criminally frivolous attitude toward the interests of the party, demanding moreover, the sternest party punishment." But taking into consideration "the existence of opposition sentiments among a considerable section of the trade union fraction," the investigation committee, having confirmed the decision of the Central Committee found it necessary to add its decision "to administer a stern rebuke to Comrade Tomsky." Riazanov, deprived of his rank and insignia, was dispatched abroad "to get an airing," while Tomsky was sent to Turkestan for meditation. Having made a clean sweep of the Communist trade union fraction which seemed infected with the spirit of the Workers’ Opposition, the Central Committee betook itself to the union of metal workers. Here it clashed with the Workers’ Opposition on the question of the composition of the All-Russian Central Committee of the Metal Workers Unions. The Workers’ Opposition, which was strong in this union, wanted to carry its own slate of candidates, but the Central Committee of the Communist Party approved instead the slate of the Petrograd organisation, which was loyal to it, and in which the Opposition was given only a very small representation. Shliapnikov protested, declaring that he would resign from the committee appointed by the Central Committee to run the metal workers convention and demanded that his name he struck off the slate. But he was not permitted to do as he wished. The Communist fraction of the convention of metal workers rejected the slate approved by the Central Committee of the Communist Party "by a majority vote of 120 to 40." Thereupon Lenin’s Central Committee simply is sued an order to have the slate of the new Metal Workers Central Committee approved. The representatives of the Workers Opposition began boycotting the newly appointed body absenting them selves from its sessions, as a result of which its Presidium came to include only one member of the old Central Committee of the union Then the Central Committee of the party took charge of the whole affair appointing at will tire entire Presidium of the Central Committee of the Metal Workers Union. The Communist fraction of the convention, roused to indignation by the violence of the Party’s Central Committee, adopted the following resolution: "The Communist fraction of the convention of metal workers, while submitting to the decision of the Central Committee, resolved to protest against it at the next convention of the party." They decided to complain to Pilate about Pontius! From Lenin’s terroristic regime in the party, there emerged an illegal intra-party literature and groups who carried to the rank and tile the struggle against the dictatorship of the Central Committee, against the party oligarchy and patricians Thus "The Bulletin of the City District Committee of the Communist Party of Moscow" reports that during the soviet election the leaflets of "The Group of Revolutionary Left Communists" were spread among the workers. One of those illegal leaflets contained the following: "All leaders betray and become turncoats, even the leaders of the Workers’ Opposition, who, perhaps, do it unconsciously, but they do betray the interests of the poor. … Let us spur on the timidly silent oppositionists-the Kolontays, the Shliapnikovs, the Perepechkos, the Ignatievs-in the name of revolutionary principles, for workers’ opposition, for its organization!" Further, ‘the Bulletin" reports another leaflet as saying: "One elects the bureaucrats Lenin and Trotzky in Soviets twenty times and over, despite that they are absolutely worthless for the Soviets." - "Organize, agitate and fight for Communists from the rank and file, the trade unions, the workers’ opposition, for Left Communists." This agitation seems to have met with some success for after the elections (according to the "Bulletin") more than 200 deputies, expelled members of the Communist Party, were elected but nevertheless were deprived of their seats in the Moscow Soviet. At the same time the Workers’ Opposition took its case to the Communist International. The latter, wholly depending upon Lenin’s Central Committee, decided, of course, in favour of Lenin and Trotzky and against the Workers’ Opposition. The declaration presented to the Communist International is known as "the declaration of 22", but actually it contains more than 400 signatures, chiefly those of metal workers. Dissatisfied with the decision of the Communist International, the Workers’ Opposition took this question to the rank arid file, demanding that the Comintern reconsider its solution. In some places its resolutions were carried, as was the case, for instance, at the district conference of the metal workers union of Zamoskvoriechie. This activity of the Workers’ Opposition vexed and frightened the party leaders who, therefore, extended their drive, though they still were shying away from too drastic measures. All those who signed the declaration presented to the Comintern were dispatched under various pretexts to localities which were undisputedly loyal to the Central Committee. Shliapnikov, who had previously been sent’ as an honourable exile to Astrakhan, was now ordered to take a trip to Northern Caucasia. But the struggle of the higher-ups with the genuine proletarians of the party became every day more intense: replacements, removals, exiles, expulsions and arrests became more frequent; but still no bloodshed. Communist blood was shed for the first time on February 16, 1922, only a month before the eleventh convention of the party; in the struggle against the Workers’ Opposition, the blood of a Finnish Communist emigrant, Voita Eloranta, was spilled. There exists a legend to the effect that Lenin tried very hard to eliminate capital punishment as a way of solving party disagreements. While this may be so with regard to outstanding party leaders (though we doubt it very much), it certainly was riot true with regard to rank and file party members. It is only necessary to point to the executions of the Kronstadt Communists, the Communists of Baku (e.g., the old Communist Yegorov) and Trotzky’s terroristic activity on the fronts of Civil War, in order to refute this legend; the shooting of Eloranta tells us that Lenin would not stop even at the shooting of party leaders when he believed the situation warranted it. The legal murder of Eloranta is characteristic of Lenin and worthy of note. Here is how it happened. On August 31, 1920, a group of young Finnish Communist immigrants, who had found refuge in Petrograd following the destruction of the revolutionary movement in Finland, attacked the Central Committee of the Finnish Party and killed nearly all its members. The toll was eight dead and eleven injured. The cloud of mystery over the case has never been completely cleared away, although the investigation dragged on for quite a long time. It was only on February 12, 1922, that the ease came up before the Supreme Revolutionary Tribunal. The perpetrators of the murders were sentenced to five years of prison, but Eloranta, who did not take a direct part, was sentenced to die. Who was this Eloranta and what role did he play in the mass murder? What were the motives back of it and why was he singled out for extraordinary penalty? The verdict of the Supreme Tribunal, published in the Izvestia of February 17, 1922, states that Eloranta was a journalist, an old member of the Finnish Social Democratic Party. Following the split of this party he became "an influential member of the Finnish Communist Party," heading "the growing Communist Opposition." Because of that he was considered morally responsible for the murder and its ideological instigator, on which grounds he was sentenced to be shot. We can well see now that Stalin was not breaking new ground when he shot Kamenev and Zinoviev as "morally responsible" for Kirov’s murder: here, too, Lenin left beautiful examples to be copied by his successor. The charges against Eloranta were formulated thus: "He carried on a demagogic agitation against the Central Committee of the Finnish Communist Party"; then: "taking advantage of the distressed condition of the Finnish workers after the defeat of the Communist revolution in Finland, he gathered around him a group from the growing workers’ opposition, involving it in squabbles with the Central Committee of the Finnish Party"; "he used his experience as an old member of the Finnish Social-Democratic Party to instigate the younger and politically inexperienced comrades, pushing them toward a bloody reckoning with the Finnish Central Committee, while himself playing the hypocrite and hiding behind the backs of the comrades from the workers’ opposition." Further: "lie induced members of his group to adopt a collective decision to commit a terroristic act." The slightest analysis of the charges will indicate insufficient ground for a sentence of capital punishment. The court could not even accuse Eloranta of direct incitation to murder. The verdict shows clearly how political accounts with the opposition were settled; moreover, the Presidium of the All-Russian Central Committee of the Soviets resolved, contrary to the decision of the Supreme Revolutionary Tribunal: "To countermand in this particular case the amnesty of the third and fourth anniversaries of the October Revolution, and to execute the sentence as originally passed by the Supreme Tribunal." And on that very night "the sentence in respect to the citizen Voita Eloranta was carried out." Thus a preconceived political murder, the assassination of an eminent ideologist of the Finnish workers’ opposition, was committed, with the aim of intimidating the workers’ opposition within the Communist Party, which, despite the decision of the tenth party convention refused to cease its propaganda. The charges against Eloranta were formulated in such a way as to announce to leaders of the workers’ opposition that they could likewise be applied against them, too. This murder could not have been carried out without the intervention of the Central Committee, or rather its Politburo; that is, the intervention of Lenin, for the Presidium of the All-Russian Central Executive Committee of the Soviets could not make independent decision, especially in political cases of such a nature. Once more the oppositionists were reminded that in the struggle for power in the party and in the country, Lenin would not stop even at shootings. In fact, at the eleventh party convention Lenin made a statement to the effect, threatening Shliapnikov, the opposition and all violators of party discipline with machine guns. "To retreat after a victorious offensive is very difficult; but in this case we have a different set-up. In an offensive-even without discipline everyone rushes forward eagerly; in a retreat, the discipline must be more conscious and is a hundred times more necessary; for when the entire army is in retreat, it does not see clearly where to stop; under these circumstances a few panicky voices can cause a general stampede; here is a paramount danger. When a real army has to retreat, machine guns are placed in the rear, and whenever a regular retreat turns into a disorderly stampede, orders are issued: ‘shoot!’ And that is quite justified. "If certain people, even though they are guided by the best intentions, cause a panic at the moment when we are engineering an unusually difficult retreat, and when the main task is to preserve order, it is then necessary to punish severely, brutally, ruthlessly the slightest violation of discipline. This holds true not only in regard to some of our intra-party affairs, but-and one should particularly bear this in mind also in regard to such gentlemen as Mensheviks and those of the Second and a half International". "Poor Shliapnikov! Lenin was going to set up machine guns against him! "We speak, of course, about ways and means of exercising party pressure and not about machine guns. We are in earnest about machine guns only in regard to people whom we now know as Mensheviks and Social-Revolutionists..."
However, the fate of Eloranta was staring everyone in the face, and Lenin’s mention of machine guns remained in everyone’s consciousness as a threat and a warning. Who knows: had Lenin’s work not been interrupted by illness and eventually death, machine guns might have rattled much sooner and with greater force than under Stalin, who in the field of terror only slavishly emulates his teacher. The eleventh party convention was the last at which Lenin was present. There all oppositions had vanished except for the Workers’ Opposition, which had been quite active in the interim between the two conventions. Its rebellion against Lenin’s "New Economic Policy" had, as we have already seen, provoked a threat of machine guns. The Workers’ Opposition presented a protest to the Communist International, wherefore the Central Committee headed by Lenin bore down vehemently upon it at the eleventh convention. What exasperated Lenin and the higher party bureaucracy most was the demand to limit the autocratic rights of the Central Committee, especially its control of allocating party members. "If the Central Committee," Lenin said, "is to be deprived of the right of placing party members, it will not be able to direct and shape party policies. Though we do commit errors here and there in relocating people, I still take it upon myself to say that the Politburo of the Central Committee made only the minimum of mistakes. This is not mere bluster on our part". The Workers’ Opposition insisted that this right be circumscribed in view of the fact that the Central Committee misused its prerogative in the struggle against all those who took issue with it. Lenin confesses that even "long before" the Appeal of the 22, an attempt was made to get rid of Shliapnikov: "A big majority in the Central Committee was in favour of having him expelled: but the vote for expulsion fell short of the two-thirds majority required by statute". The eleventh party convention, on the basis of the data furnished by the investigation committee recognised that "the continued activity on the part of the Workers’ Opposition during the past year, contrary to the unconditional decision of the tenth convention against factional groupings, conferences, and struggle, injures the party." The convention resolved "to subscribe to the decision of the Executive Committee of the International in regard to comrades Shliapnikov, Medvediev and Kolontay, and to instruct the Central Committee to expel those comrades from the party if in the future they manifest a similar anti-party attitude". The convention resolved to expel Mitin as "a malicious disorganizer," and Kuznetzoff "as alien to the proletariat." Following the expulsion from the party and the arrest of the members of the Paniushkov’s "Workers and Peasants Socialist Party," there followed, as we have already seen, the expulsion and the arrest of G. Miasnikov, and the shooting of Eloranta. Now came the turn of the Workers’ Opposition. But neither did the intra-party terror nor that in the country brought the desired appeasement. On the contrary, the discontented elements, mainly workers, were driven to organize illegal factions and wage an underground strike against Lenin and the Central Committee; soon underground Communist literature made its appearance. Apart from the above referred to "Revolutionary Communists" of the fall of 1921, there emerged the group, Rabotchaya Pravda which published an underground magazine of the same name. Its position was outlined in its illegal "Appeal to the Revolutionary Proletariat and All Revolutionary Elements Who Remain Faithful to the Struggling Working Class". This group was begotten by the NEP (New Economic Policy) or as "use Appeal" has it, by "the restoration of normal capitalist relationships." lt. maintained that in the present situation Russia should be transformed into a country of advanced capitalism from which a new working class and new working class party would arise. Said they: "Following a successful revolution and a civil war, wide perspectives have opened up before Russia. In the rapid transformation into a country of advanced capitalism, lie vast potentialities for the October revolution." "An intelligentsia composed of technicians and organisers who direct and conduct the entire organisation of production is coming increasingly to the fore. "In its ideology and methods of work it is thoroughly bourgeois and all it can build is a capitalist economy. A new bourgeoisie is now being created by the merging of the business elements of the old bourgeoisie and the rising class of intellectuals-the organisers of social life. "The soviet, trade union and party bureaucracy and the organisers of state capitalism are placed in material conditions differing markedly from that of the workers. Their security and material prosperity depend upon the extent of exploitation and subjection of the toiling masses. There rises inevitably a contradiction between the interests of the workers and those of this ruling group-a divorce between the Communist Party and the working class. "The social existence of the party leaders necessarily determines their social consciousness, and the interests and ideals which run counter to those of the struggling proletariat. "The Russian Communist Party became the party of the intelligentsia who are the organisers of every branch of our existence. The gulf separating the party and the working class is becoming deeper, and this fact cannot be glossed over by any resolutions and decisions of Communist conventions, conferences, etc. The group held that in the near future the dominant role in Russia would belong to commercial capital, along with which there would also grow the influence of the State "as the representative of the national interests of capital" and that the proletariat, because of its constant subjection as well as the lack of its own party, would not be able to play a dominant role. Hence Rabotchaya Pravda demanded the organisation of a party of the Russian proletariat. The tasks of that party were to include the struggle against the exploitation of the proletariat and for democracy as opposed to the arbitrary rule of the administration. Rabotchaya Pravda was against the Workers’ Opposition on the ground that "the Workers’ Opposition was valuable to the extent that it contained revolutionary elements, but objectively it is reactionary, aiming to revive the slogans and methods of military Communism which by now have been antedated." The group claimed further. "that the Russian working class-once the vanguard of the international proletariat-had now retrogressed to its position of several decades past." Consequently, the organisation of a new party would be a long and difficult job. It would proceed by way of illegal groups within the Communist Party; the members of these groups were to be carefully selected and to operate in strictest secrecy. Before it was finally suppressed, Rabotchaya Pravda managed to issue another document, entitled "An Appeal to the Twelfth Convention of the Russian Communist Party." here it demanded improvement in the conditions of the working class and cessation of their exploitation, rationalisation of production, restoration of militant trade unions, granting the workers the elementary rights of class struggle and self-organization. In the same period between the eleventh and twelfth convention there appeared within the Russian Communist Party a new illegal group which sharply criticised the party’s reign of terror, the growing inequality of income, favouritism and bureaucracy this group sought the salvation of the revolution in the establishment of intra party democracy, but it went no further in its demands It urged that Zinoviev, Kamenev and Stalin he removed from the Central Committee as the persons most bureaucratised and most instrumental in suppressing freedom within the party. This group, we see, was the precursor of the "Trotzkyite" opposition". The first party convention to he held without Lenin-the twelfth was conducted under the direction of the all-powerful triumvirate: Zinoviev, Kamenev and Stalin. There was no articulate opposition at this convention. On the surface, everything seemed quiet, although underneath, discontent was simmering. New factions were being formed constantly. The Central Committee was expanded and renewed, but none was admitted who showed any oppositionist leanings: all those suspected of "Trotzkyism", all those eliminated from the Central Committee after the trade union discussion, were excluded. Some, like Ossinsky and Rakovsky, were dispatched abroad, as ambassadors to a sort of honourable exiles. While the triumvirate deprived him of power Trotzky was forced to play the role of the most loyal interpreter of the party line. I. N. Smirnov, the ex-ruler of Siberia, was not re-elected to the Central Committee. In only one respect was the unity genuine, for unanimity existed in the struggle against the proliferous rank and file oppositions. And the new Central Committee took drastic steps to suppress the opposition within the party. At the September plenum a decision had been passed to arrest members of the opposition; in the latter part of September arrests of the members of Rabotchaya Pravda occurred all over the country. About 400 were taken, among them the old Marxist philosopher and economist A. A. Bogdanov (Malinovsky) who was suspected of being the ideological leader of Rabotchaya Pravda. In order to bring the group into disrepute, the official party press hinted about its alleged connection with the Entente Intelligence Department. (This method, as we already know, was widely applied by Stalin against the executed Kamenev, Zinoviev, Preobrazhensky, Piatakov, Bukharin, Rikov, and against the exiled Trotzky). In answer to these vile insinuations Rabotchaya Pravda issued an appeal to the workers of the Western countries. Mass arrests succeeded finally in smashing this group. Two months later the illegal printing shop of the Workers’ Opposition was uncovered in Moscow. "Of late it has become quite common for people who were expelled from the party during the purge to assert themselves as anti-Soviet in their attitude; to openly criticise the Soviet power, the Communist Party and its eminent leaders; to set themselves up as ‘true Communists’ in contra-distinction from the mere ‘holders of party membership cards’. Their attacks always revolve around the role of the trade unions in production and they are distinctly counterrevolutionary. "It is to be noticed that the expelled members of the party who formerly belonged to other parties, revert to their original platforms, act upon the instructions of those parties and put forth such slogans as ‘freedom of speech and assembly’, ‘free soviets’, ‘full political rights and liberty’-of which all anti-Soviet parties, Monarchists included, take full advantage. "These expelled party members represent quite a force in their capacity as agitators and organisers, and very often they not only sow seeds of discontent among the young members of the party but also mislead those in responsible positions, especially in peasant localities. Organised into anti-Soviet parties (Mensheviks, Social-Revolutionists, etc.) they carry on their work of demoralising the young. Communists. "There are cases where ex-members or the Communist Party establish connections with bandits in their area, extending all kinds of aid to them. Since this involves them in some of the most pernicious anti-Soviet activity, every method of repression may justifiably be applied against them. Therefore, it becomes necessary: 1) to register all ex-members of the Communist Party who have come out at rallies, meetings, conventions, conferences with anti-Soviet agitation and false rumours; local registration should be co-ordinated with that of the district and county party committees; 2) to investigate those who are most active in this subversive agitation and to place them under secret surveillance to determine their connections with other groups and parties; 3) to find out who of the expelled members of the party are still holding responsible positions (especially in the village soviets, the sections of the county party committee, at the mills and factories), to observe their behaviour, and in ease of any anti-Soviet action, to request their removal; 4) to accomplish this work in strict secrecy, in view of the fact that many of those expelled from the party formerly held responsible positions, such as chairmanship of the executive committee of the provincial soviets, and they have not yet lost their connections." Incidentally, the only ones whom the "Circular" did not recommend to be placed under surveillance were those who had been expelled for self-seeking and criminal activity. One more group -the so-called "Workers’ Group"- was suppressed while Lenin was still alive. Relevant information is available in V. Sorin’s pamphlet: The Workers’ Group published by the Moscow Committee of the Russian Communist Party and written on the basis of the data of the GPU, materials taken away from the arrested and their depositions. According to Sorin’s pamphlet, "The Workers’ Group" grew up in the spring of 1923. Its platform was based upon the brochure by G. Miasnikov, Disquieting Problems, which, with a few editorial changes and corrections (by Miasnikov, Kuznetzov and Moseyev) was issued as "The Manifesto of the Workers’ Group of the Russian Communist Party." In April, Miasnikov was arrested and the group disrupted, but soon it recovered, and on June the fifth it already had an illegal conference in Moscow. It carried on negotiations with the leaders of the former Workers’ Opposition-Kolontay, Shliapnikov, Medvedev, Ignatov and Lutovinov who differed with the manifesto only on problems of tactics since they insisted that propaganda should be carried on among party members only. Negotiations were carried on with Riazanov, Nevsky and Kuznetzov who declined to ally with the faction, although (to the surprise of the Workers’ Group) they did not advise the Party Central Committee of its existence. The membership of this group is difficult to ascertain. V. Sorin believes that there were never over 200 members in Moscow. In the summer the Moscow organisation of the Communist Party conducted a purge, having first expelled the partisans of the Workers’ Group. In August, the latter intended to organise a general political strike, but the G. P. U. getting wind of the matter, succeeded in liquidating it by September. This was, as we have said, the last intra-party opposition to be liquidated by police and party terror while Lenin was yet alive. And this, perhaps, was the last workers’ opposition within the party to be crushed by the united efforts of the party’s upper crust, which itself soon began to disintegrate. The struggle for power, the dividing of the inheritance, took on the character of a personal strife among the Bolshevik magnates; they resorted to every means evolved by Lenin: the seizure of the party apparatus, removals and replacements, honourable exile, the threat to expel and actual expulsions, arrests, deportations by administrative decree, prisons and finally, mass shootings. The eleventh convention of the party was held without Lenin who could not attend on account of illness; there was no hope for his recovery and before the twelfth convention a new discussion commenced, the real issue of which was the competition for power between the triumvirate-Zinoviev, Kamenev and Stalin on the one hand and Trotzky and other party leaders on the other. The party rank and file were nonplussed, unable to understand what the struggle was all about. On December 11, 1923, at the meeting held by one of the Communist cells of Moscow, the worker Gourov declared: "The workers will ask me what are the basic disagreements. To say quite truthfully, I do not know what to tell them." Sapronov: "Now we hear everyone harping, as Comrade Kamenev does, upon the name of Lenin. To keep on referring to the fact that one has been Lenin’s friend and to imply that one will remain a Leninist all his life is demagogy pure and simple. Those people merely seek their salvation by hiding behind Lenin’s back." (Pravda, No. 284). Stalin: "The Opposition has made a habit of extolling Lenin as the greatest of all geniuses. I am afraid that this praise is not altogether sincere. They want, by raising the ballyhoo about Lenin’s genius, to camouflage their own abandonment of him and to stress at the same time the weakness of his disciples. - But permit us to ask you, Comrade Preobrazhensky, how is it that you found yourself in profound disagreement with this great genius on the question of the Brest-Litovsk peace? And Comrade Sapronov, who now falsely and pharisically showers praises upon Lenin, is the very same Sapronov who at one time dared to label him an ‘ignoramus’ and ‘oligarch’." (Izvestia, No. 18). Bukharin: "After October our party experienced three crises: the crisis of the Brest-Litovsk peace, the trade union crisis and the present one. In all those stages of, party development, Comrade Trotzky was in the wrong." (Pravda, No.294). Preobrazhensky: "The policy which is now being carried out is not class policy within our party, but a policy of petty squabbles and splits. When we spoke of Lenin’s role in the party we had in view a program that was benefiting the working class as a whole. But you cannot completely replace Lenin: you have so much less talent but so much more presumption." (Pravda, No. 12). Stalin: "Comrade Trotzky identifies himself with the Bolshevik Old Guard, thus opening himself to whatever criticism may fall upon the heads of an Old Guard if they take the road leading to degeneration. This readiness for self-sacrifice no doubt bespeaks a noble character. But I must defend Comrade Trotzky from Comrade Trotzky, since he, for obvious reasons, cannot and should not bear responsibility for the possible change for the worse of the basic cadres of the Old Bolshevik Guard. Do the Old Bolsheviks stand in need of this sacrifice? I do not believe so. … But on the other hand, the party does contain certain elements which lead toward degeneration: I am thinking of those ex-Mensheviks who willy-nilly joined our party and who have not lived down old opportunist habits," (Pravda, No.285). Kamenev: "We know that our state apparatus is utterly worthless. And when the same is implied of our party apparatus as in the speeches of the oppositionists, we ask them: ‘What is it that you want us to do?’ The state organisation is utterly worthless and now you (Preobrazhensky, Sapronov, Drobnis) try hard to make the party appear in the same light. You said in your resolutions that the Central Committee, impelled by fractional aims only, by its urge to retain power, turned this apparatus into a seat for cowards, sycophants, careerists. - But what instruments are we to use for governing the country if, as you say, our state machinery has to be destroyed while the party apparatus, you maintain, is manned by sycophants?" Kamenev: "Some oppositionists say: you did write a good resolution, but you acted like Tar Nicholas II did with the manifesto of October 17. Well, overlooking the comparison of the Central Committee with this personage (a comparison which reveals much concerning those who advanced it), what is its political meaning when decoded? It means: Under pressure you wrote a good resolution, but you will deceive the party." (Pravda, No. 10). Preobrazhensky: "You have shown here in regard to Comrade Trotzky a monstrous lack of consideration. First, we of the opposition headed by Comrade Trotzky, are alleged to be political bankrupts. But then we are told that Trotzky is indispensable. This is ambiguous. If the charges preferred against him are true, he should be eliminated not only from the Politburo but from the party as well; but if your charges are false, then you are attempting to deceive the party." (Pravda, No. 11). Sapronov: "The victory which Comrade Kamenev and others have just celebrated is such that, if repeated, would leave Comrade Kamenev and others, despite all their victories, without an army." (Pravda, No. 12). Stalin: "There can be no double standards as far as discipline goes: one for workers and another for magnates. Comrade Trotzky’s error was that-he set himself apart from others, believing himself to be a superman standing above the Central Committee and its laws." (Pravda, No. 17). Preobrazhensky: "I believe the basic error admitted by the politburo in regard to Comrade Trotzky was that of treating him as an alien in our midst. With such an attitude, no joint work is possible. This should be clearly understood. (Pravda, No. 17). Zinoviev: "Comrade Radek did everything possible as well as impossible to prevent the Comintern from carrying out its decision. He utterly refused to submit to the derision of the Central Committee of our party. We asked him: will you carry it out? He said: no, for I was elected by an International Congress, and not by you... Comrades Trotzky, Radek and Piatakov wrote counter-theses appealing to the German workers over the heads of our Central Committee." (Pravda, No. 20). Preobrazensky: "Comrade Bielenky talks always about ‘genuine factory workers’, but at the same time you overlook what has actually been going on among these workers. As a result, bigotry developed -genuine factory workers’ you say-and at the same time we ignore what is going on among workers and thereby we bring the party on the brink of a great disaster." (Pravda, No. 12). Stalin: "There are people who are the masters of their tongue; they are average folk. There are others, however, who are swayed by their tongue, who are governed by it; they are more extraordinary. Comrade Radek belongs to the latter category. Such a man can never tell beforehand what his tongue is liable to blurt out - Can we, then, rely upon such a comrade as Radek?" (Izvestia, No. 18). Such is the character of the "discussion" which the leaders of Lenin’s "slaveholding democracy" were carrying on. The plebeian elements of the party were crushed by the joint efforts of the ruling strata, but no sooner was the danger from that direction obviated than the Communist patricians began their internecine strife-a naked, shameless struggle for power in the party and in the country. The party was torn by this conflict of groups and cliques who, failing, however, to unite in their opposition to the Central Committee, suffered one defeat after an other. MAXIMOV, The Guillotine at Work. Twenty Years of Terror in Russia (Data and Documents), The Chicago Section of the Alexander Berkman Fund, Chicago, 1940, 624 p.